18 May 2016, at 12:00a.m. 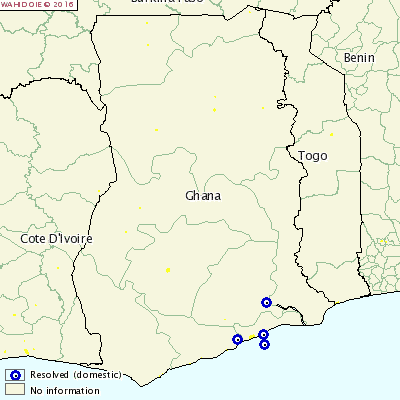 GHANA - Two outbreaks were reported in Greater Accra, and one each in Eastern and Central regions. The outbreaks were of the H5N1 strain and affected mostly layers and chicks on farms. Over 4000 birds died and another 21,000 were destroyed as a result of the outbreaks, which occurred during April.